Not sure what the 17 rear crossbar looks like. I utilized the slot in the back of the rear crossbar on my getaway as a support. I'm sure you could modify my design to make it work for you. Updated my old post, just wanted folks to see the final product which I am very happy with. I am trying a different approach for an electric motor mount for my Hobie Getaway. I was determined not to drill any holes in the rear cross beam and not interfere with the sliding truck of the rear winch. I used a piece of 1x4 by eight foot six inch long wood to provide support and to counteract downward/forward thrust from the motor. The wood goes all the way to the front beam and fits under some tramp lashings. It all tucks nicely under the tiller bar which provides about one foot space between it and the rear beam when the rudders are down. 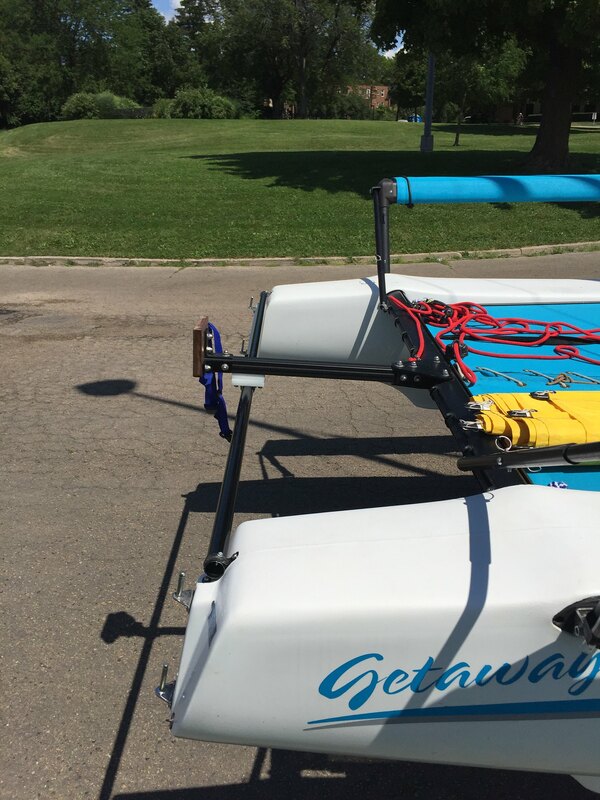 When the rudders are up, there is less space but the tiller bar is higher and does not interfere with the motor. The electric motor I have bought has a head that is about 8" wide and will fit onto the 1 x 4. That way the motor will hang parallel to the back beam when not in use and swing down when needed. With the rudders up it goes about 10 kph on max, faster than walking speed. See attached pictures. Last edited by PJW on Thu Aug 31, 2017 9:55 am, edited 1 time in total. Here's my motor mount with a Home Depot fence rail for a cross brace. I shimmed it so the cross brace didn't interfere with the rudders. I am assembling Keith's motor mount for use with my Torqeedo 1003 on the Getaway. I guessed wrong on the hardware for the mount, and thought I'd add the list of bolts, nuts, and washers I finally ended up with to save somebody else a couple of trips back to the hardware store. All bolts, nuts, and washers are 5/16 inch diameter by 18 threads per inch. Dimensions listed below are length, except for the set screw. * Our local hardware stores here around Cleveland, Ohio do not carry stainless steel carriage bolts shorter than 1". I ordered the 3/4" bolts from BoltDepot.com. It looks like Keith only used flat washers in a few locations. I bought more because washers spread the loads, and lock washers slow down or stop loosening due to vibrations. Also, they are cheap. Use your own judgement on where and how many. Last edited by dpalac on Thu Oct 05, 2017 9:25 am, edited 1 time in total. Thanks dpalac. Good luck with your new motor mount. Hope it works as well for you as it has so far (2 seasons) for me. I am adding your hardware count into my original post. A public thanks to Keith! My mount is on, and I sailed with it just once so far in moderate Lake Erie chop. Sturdy and steady. It’s great to see the Torqeedo sitting nice and vertically up out of the water, with the prop just at the right depth to get a good dig into the water. It cavitated only once when a 4 foot wake came up under the stern, but dug right back in in less than a second. Thank you, thank you, thank you! I had a Cheata mount previously on the port side, and I attempted to install Keith’s mount on the same side, but changed my mind when I fitted Keith’s mount onto the crossbar and saw that the holes for it would overlap the Cheata holes. So I moved Keith’s mount to the starboard size and plugged the Cheata holes in the crossbar with the epoxy putty. One of these days I’ll sand down the putty and paint - too busy sailing now. Oh the wood mount idea attached to the tramp is great for the lighter electrics! I like the earlier mount that the Honda is on as well, these are really good. Any body have a mount for sale for the Honda level weight? I have a 3.5 hp tohotsu 4 stroke outboard from another sailboat. Looks like it is 41 pounds which seems to be too heavy for the cheata mount. (BTW Honda 2HP is about 30 lbs.) However, I found a used cheata mount for the getaway and have an idea to use it in conjunction with the new rear crossbar support that dorienc and wanderoo222 are using. By adding that extra support, maybe 41 pounds will work? I see the u strap screwed into the plastic to anchor the new crossbar to each pontoon. How thick is that plastic? Any tips for screws to use here? I had the Cheeta mount, but replaced it with the homebuilt mount; it holds the motor higher and you get less splashing than the Cheeta creates. It cost about $100 to make the homebuilt mount that Keith designed. But if you've already got the Cheeta mount, they do the job. I used "toprail galvanized painted fence rail from home depot, with 2 conduit clamps. I used 1-1/2" sheet metal screws to hold the clamps down. Make sure to mount them with your rudders and tiller in place so the rudder arms don't interfere. My Torqeedo weighs 29#, so with the crossbar you should be OK with the heavier motor. I put short sheet metal screws through the conduit clamps into the cross rail, because it shifted sideways. thanks Bob, I see those extra sheet metal screws now through the pipe and the clamp, I will add that detail as well, that's a great tip. I wound up getting the chaeta in a package, maybe I paid 125 -150 for the chaeta itself, and I would probably procrastinate forever building the whole thing, so it seemed to be the way to go. However, I think I can handle that new crosspiece, that is a great idea. I guess that will be my design then. And I will take your advice to put the rudders and all pieces in place before I finalize the locations. Do you put any sealant in the holes when you install the 1 1/2" screws? No, I didn't seal the holes. I drilled pilot holes, and used self-tapping screws. I think any in-leakage will be trivial, particularly in that location. I pull the drains out at the end of every season, and so far, I've not gotten even a drop of water out of them. looks very straight forward, thanks Bob! 1) I couldn't get over the piece that sticks into the cross bar. The torsional force on this load is high given the short distance from the fulcrum point (i'm not a physics expert but I intuitively sensed this) And since we have to drill the cross bar anyway, I put through bolts all the way and used a stacked sandwich of plates to get the spacing right. 2) I also specifically designed mine to minimize the length of the extension bar to also reduce torsional (rotational) force on the cross bar. 3) I am using the Torqeedo motor which hangs down a lot even when in the up mode. I liked the fact that the cheetah mount raised up as I often take out several adults and so the hulls are loaded down in the water. I didn't want the motor splashing and draggging, so I designed a hinge mechanism to raise the motor up. BTW, I like the torqeedo as i mount just the motor and have a battery extension cable to keep both the tiller and the battery on the boat (further reducing weight from the motor mount and the forces on the cross bar).